On most days the park next to St. Frances Neighborhood Center is an open drug market. But one day a year, the drug dealers take the day off and allow the community to host the Reservoir Hill Resource Fair and Music Festival. Two years ago, Morgan Ruhnke was a vendor at the community festival and immediately fell in love with the area. 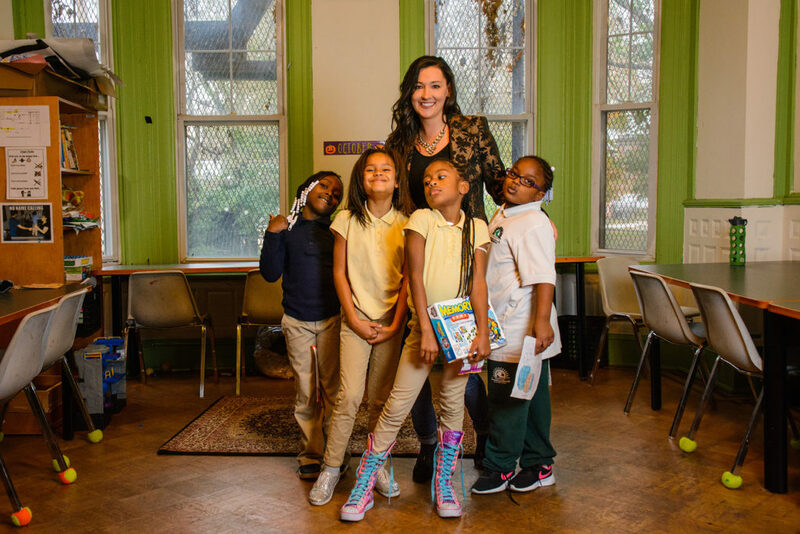 “I saw that kids needed the consistency of people to help them.” So, she began to volunteer on a part-time basis for about a year and then she transitioned into a fulltime development role at the Center. In her role at the Center, Morganne now helps to run the festival, which she hopes to help grow and serve more people. The St. Frances Center sponsors the festival, which attracts over fifty vendors each year. The vendors offer HIV testing, substance abuse help, bike repair, financial literacy and free cleats. “We look and see what type of things are needed. They don’t have computers or the luxury of going to the internet to solve problems, so we help the residents help themselves,” she explained. As long as residents stop by five different resources, they get a bag of groceries and children receive a book bag with school supplies.